Between World Wars I and II, this stretch of Meridian Street became home to the wealthy and social elite of Indianapolis: industrialists, professionals, and merchants, among the foremost leaders in the community. The district is a living encyclopedia of American architecture from the roaring twenties, when tradition returned to overtake Arts & Crafts modernism. 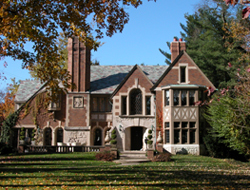 The city’s leading architects designed many of the palatial homes in a variety of high styles including Tudor Revival, Jacobean, Colonial Revival, Neo-Classical, and Prairie styles. Meridian Street had long been the upper class address of choice. It did not extend north of Fall Creek until the completion of the street and the advent of city services in the early 1900s, when wealthy homeowners finally sought out Meridian Street north of 40th. 4270 North Meridian is one of the earliest remaining houses in the district. Built in 1911 for the Hare family, the house is influenced by both Tudor and Craftsman styles. It became the home of famous Hoosier author Booth Tarkington from 1923 until his death in 1946. A two-time Pulitzer prizewinner, Tarkington earned wealth from his novels based on Indiana families and their surroundings, such as The Magnificent Ambersons. Tarkington described the houses in his neighborhood as having a “picture book house” appearance. One of the fanciful later Tudor Revival buildings, the McKee-McKinney-Schaler House at 4906 North Meridian, features a rambling plan, stone quoin work, a two-story bay window and massive front chimney. Prolific north-side home builder H. L. Simons designed the house. Across the street at 4909, the Cole family, owners of the Cole Motor Car Company, hired Frederick Wallick to plan their massive French Norman Revival-style stone mansion, complete with red terra-cotta tile roof and circular two-story tower. Classicism in various forms was another favorite choice for Meridian Street homeowners. The Thompson House, 4343 North Meridian Street, features Italian Renaissance arched casement doors, a small central portico, and broad hip roof with hipped dormers. Popular Indy architect Frank Hunter designed the house, which served from 1945 to 1970 as the governor’s mansion. That distinction then progressed up Meridian Street to 4750. In 1924, the Osburn family hired H. L. Burns to design 4411 North Meridian, which has a stately portico with triple Corinthian columns and green terra-cotta tile roof. North Meridian Street Historic District includes North Meridian St., 40th, and Westfield Blvd. (5700 block). All buildings are private homes. The Johnson’s Woods Historic District on 46th St. is nearby. INDYGO bus line from downtown: #18 Nora, disembark at 46th and Pennsylvania; walk one block west to Meridian.